Due to our ongoing drought conditions, awareness of the beneficial role native landscapes can play in supporting water conservation and wildlife habitat has never been greater. 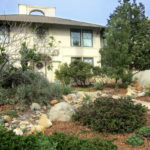 With this in mind, the Santa Barbara Botanic Garden established the Native Choice Award to recognize leadership by an individual or organization in the use of California native plants in a designed landscape in 2014. This year we were especially pleased to consider a number of private residential and business garden renovations, a nature trail, and even a municipal golf course native habitat restoration project. 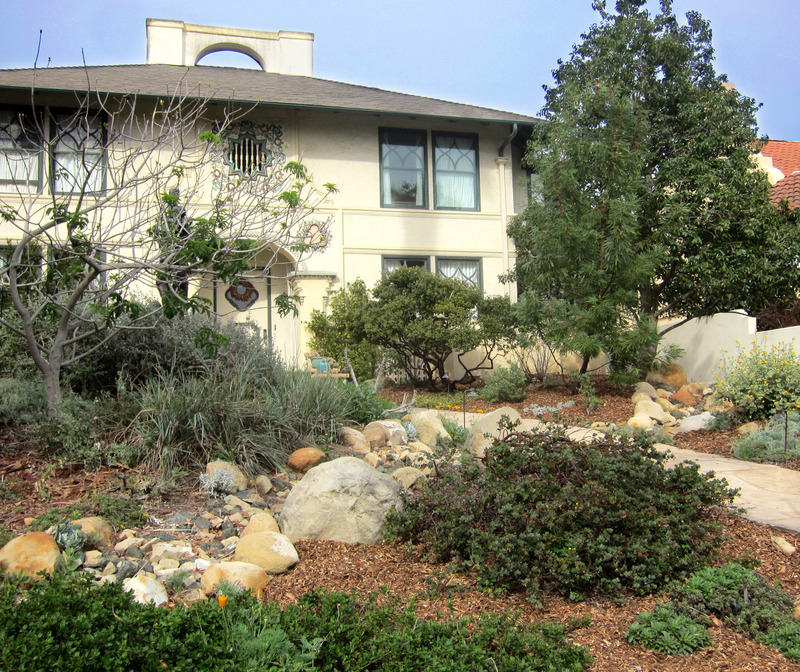 Ultimately, we selected a beautiful, mature residential landscape that made California native plants a priority long before our current drought concerns. Congratulations to Virginia Gardner and her 2014 Garden Street residence for serving as a model for us all! A beautiful example of an eclectic design sense developing over 15 years, Virginia Gardner’s front yard garden shows off some of the best landscaping plants from California’s unique and diverse flora. Towering wild cherry, manzanita, blue elderberry, oak, California buckeye, and even an exotic palm are clustered in spots within this narrow residential lot. Leaning outward, they show some of the best architectural qualities these plants have to offer and also leave a great deal of room for lower shrubs which give color and interest over a long season, like Palmer’s mallow, Island buckwheat, purple sage, Ceanothus ‘Puget Blue’ and California buckwheat. Originally designed by Terra Edwards, homeowner Gardner has continued to experiment over the last decade or more, especially delighted by the unexpected gifts brought by birds – new seedlings of toyon and oak, some of which occurred right where they look best!